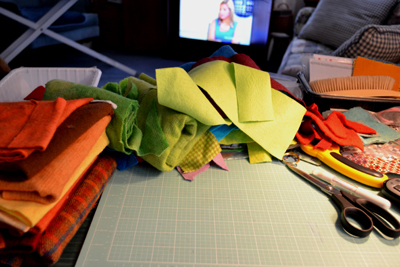 Cutting out more chicken pincushions while watching politics on TV! Bodies, beaks, combs and wings, for my new chicken pincushions. I have been living in the fast lane and am having a hard time keeping up with everything at Little House! The 2016 Bedlam Farm Open House and Craft Sale over Columbus Day Weekend was altogether too successful! I am not complaining mind you, but in only a matter of a week, I had become a video star overnight (fullmoonfiberart.com) and my pincushions seem to have become part of a mad buying frenzy, thanks to Maria's Wulf's marketing skills! 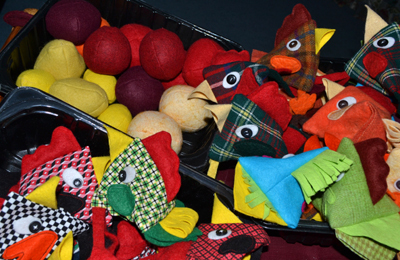 I had to readjust my plan of quilting, thinking that my crafts were sewn for the season and quickly cut out more batches of my whimsical chicken pincushions. I will feature them in my sales in November and December and sell them in my Etsy shop as well! 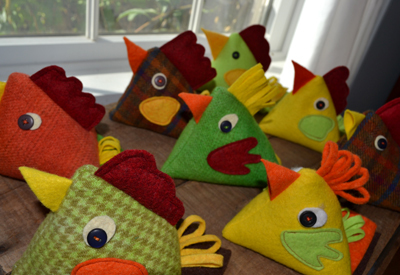 My first chicken pincushions sold out almost before Maria's sale started. 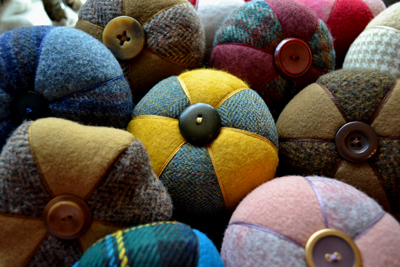 My new two toned wool pincushions for this year! Some new penny rug and biscornu pincushions to add to my collection! 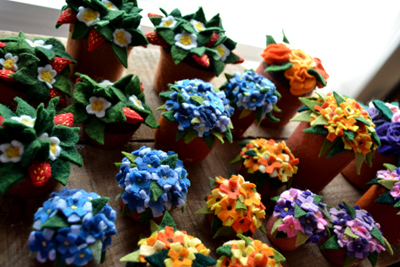 My flower pot pincushions, a favorite item, all hand sewn. 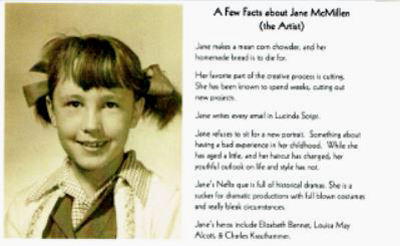 "Jane makes a mean corn chowder, and her homemade bread is to die for. Her favorite part of the creative process is cutting. 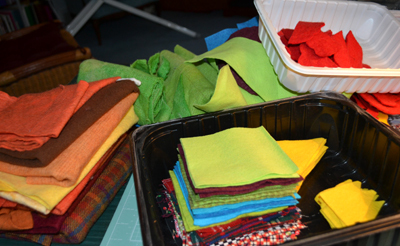 She has been known to spend weeks, cutting out new projects. Jane writes every email in Lucinda Script. Jane refuses to sit for a new portrait. Something about having a bad experience in her childhood. While she has aged a little, and her haircut has changed, her youthful outlook on life and style has not. Jane's Netflix Queue is full of historic dramas. She is a sucker for dramatic productions with full-blown costumes and really bleak circumstances. 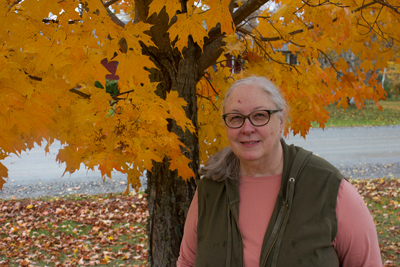 Jane's heroes include Elizabeth Bennet, Louisa May Alcott and Charles Krauthammer." Aged a little, my haircut changed, but NOT my youthful outlook and style. I am at last accepting that I am fast approaching 70 years old and am no longer meant to look like I am twenty! I am a step-grandparent now and am embracing my new rather frumpy image of the old woman that has been staring back at me from mirrors. I not only objected to all photographs for years, but have only enough mirrors in the house to check for ugly green specks of broccoli in my teeth?! Standing in the rain, a frumpy old woman but I still have a youthful outlook! 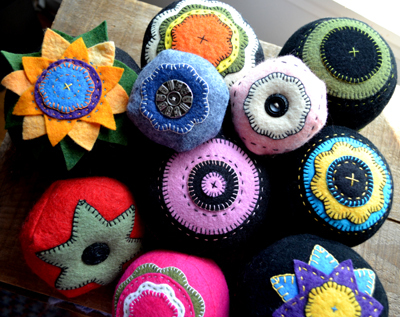 Maria is a wonder to be sure, and her video was hugely successful in selling pincushions and after the following feedback from a very dear on-line friend, it brought about some inner healing as well! "So, now I have to tell you about something that really meant a lot to me this week. I have a friend who has become so dear to me. She is wise in the best of ways, compassionate, gives of herself sacrificially even though it is especially costly for her due to health problems, and has a sense of humor, even in the midst of trials, that always brings a smile. I’ve never met her except through her words. Well, this week I got to see her for the first time…on Maria’s video, did you guess??? And Jane, I was thrilled! I could listen to your voice for hours- you have such a soft, lilting voice that is so comforting to hear, and so young! Yes, some people who are young sound old, but you have a very youthful voice. I know what you’ve said, and I truly do understand how you feel about your appearance because as I shared, I really dislike what I see in the mirror. So I’m not chiding you at all, but you are so lovely! I could go into detail, but I don’t want you to feel embarrassed or think I’m using flattery. I will say I have always coveted a nose like you possess :). It made me so happy to get to see you and hear you speak. Your pincushions are beautiful, but so is their creator. Even without makeup or clean hair, as you described your condition that day!" This is the most beautiful note ever, and I so appreciated knowing that others, like me, judge a person by their heart and not their appearance, though I am my own worst critic and I do think my friend does flatter me in both inner spirit and outward appearance! The past few weeks have indeed been eventful, for this was not the only personal challenge I had to confront! I unintentionally upset a friend by sending her a video that was political, though I did not mean it as such and added a note indicating to ignore the political statements and focus only on the medical assessment of the doctor, and sent it out "en mass" to friends. It was a video of Hillary being carried to her van, as well as other clips showing various and alarming visible signs of some sort of serious illness. I was shocked to see that Hillary appeared to stiffen, unable to walk, and the doctor's assessment concurred with my own. I didn't think I saw a fainting episode as reported, which I have observed many times during my days as a nurse, but rather something that I would describe as a "neurological event" instead. Fainting seems more of a "limp-ening" experience and not a stiffening...and I had a brother that died early of a neurological disease and my mother though dying much older, had a neurological disease as well and I am familiar with bodies that refuse to function as their brain directs! I was shocked and meant only to inform my friends "on both sides of the aisle". I learned the hard way that I was naive to NOT think that in this ultra polarized political world someone would consider it a personal jab at their chosen candidate, especially when they know of my differing political views. Sadly my friend would not hear of my good intentions! I felt like I was experiencing a bit of deja-vue when I saw video clips documenting Hillary's health condition. No matter which candidate I choose to vote for, I feel sadness when I see someone having signs of a potential serious medical illness. I have been defending myself since this conflict. My intentions define me, though I know that I fall short of the mark when it comes to living them. I consider myself to be a truly caring and sensitive friend, and while I whole-heartedly apologized to her and meant it, instead of altering my behavior to keep myself socially appropriate and mute about politics, I am rebelliously re-posting some informative posts about the presidential candidates on facebook. I recalled that somewhere in my youth I was made fun of and shamed for my passionate beliefs and I am now insisting on reclaiming my interior as well as my exterior! I will not be shamed for my political beliefs and will intentionally speak or communicate on facebook about them boldly now though inside I am still timid and scared, as it may well mean that I have no friends left after this election! I can make fun of my chosen candidate as well as myself, and after my friend tried to shame me for what I didn't do, I decided to insist on having political banter at home, "no matter what"! I am not only claiming my own political voice, though I will spare my readers of my strong political rants, but I am insisting that all of us at Little House be able to have discourse about politics without shooting or shaming each other. I now realize that any form of shaming wounds a person, making them feel like that are indeed "deplorable" for their beliefs! Whatever happened to the psychology of "I'm OK, You're OK" and America's tolerance for differing views, no matter how heartfelt we are about our own! This is America and I am taking back my overweight and unhealthy self-image hoping that others besides my friend see the good heart within, and am accepting my own political voice and allowing others to do the same! Forget social and political correctness! I am well-read on the candidates, and have opinions as to which best represents me. I claim my right of being me and expressing myself and allowing others to do the same! God bless Amendment Number One and with it Number Two as well, for while I never owned a gun, lest it get used against me, I want the right to protect myself from governments that have gone crazy and I think we are almost there!! I have indeed been very busy embracing the old woman that stares back at me in photos and mirrors as I stitch away and prepare for sales ahead. I am trying to prepare for the election as well, as disappointment often follows them as I don't seem to pick the winning candidate, ever! Could it be that I am jinxing my candidate by my support? I certainly hope not! 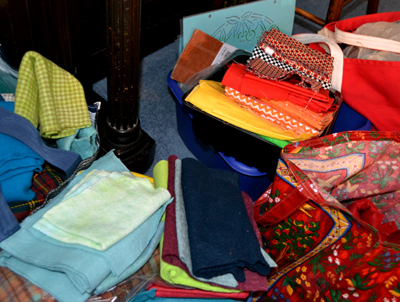 I love, love, love organized messes! New pincushion bodies waiting to be filled with crushed walnut shell filling. New fruit and chicken pincushions in process! Regarding my upcoming sales, stay tuned for my notices of their dates, times and locations. I will be at two sales in November and possibly another in December!!.... And do check out my Etsy shop which will soon have my whimsical chicken pincushions along with other new items for your holiday shopping pleasure! 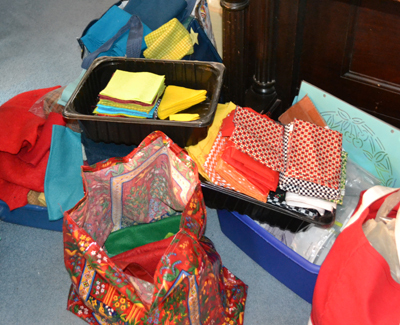 Last but not least...my daughter, Hannah McMillen, is joining me on creating items for Little House! 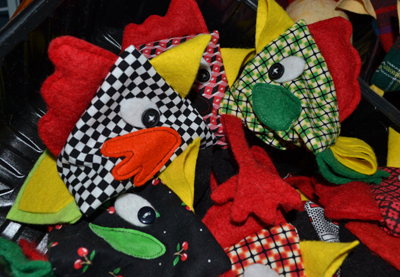 Don't miss her aprons, soft toys, knit baby hats and finger puppets! She has long been a co-creator-in-crime. She is the designer of my website. business logos and designs and loves to do my booth displays. Her business skills exceed my own and she enjoys working my sales. She is a professional artist by trade and is working to expand our offerings at Little House with her own new creations! My husband, Tom remains our silent partner, and is driver, hauler, banker, salesman, and chief-supporter of Little House! *This blog is dedicated to my friend, D.M. for sending me such healing feedback and also to Maria Wulf! It is clear that I need to accept the older and less healthy woman that I am turning into. Despite my denial and resistance to growing older, I am not getting any younger, though I continue to work at that! I blame my physical failures on my battle with Lyme disease, but perhaps psychological denial is at the heart of them all? I think I learned in nursing school that we usually peak physically at twenty one years and after that it is all downhill! Perhaps I am "normal"?! As one friend wisely advised me some time ago,"Get over it!" and that is what I am planning to do!